Now that our friend Jonas has packed up and moved on, and the sun shines once again, I just felt the need to have a play with some color! Let the sunshine in! This is Inktense blocks and Neocolor II crayons, with a little help from a white Gelly pen in my 9×12″ Strathmore mixed media journal. I’d be very curious what Jill of Jill’s Art Journal and Lin at Breathing Space would do with something like this. They are wonderful mixed media artists. Maybe I need to just sit on it awhile? I’m tempted to add large-ish circles. In white. I don’t know. Would love to know what you all think. Yes! They are wonderful. I agree, perfect for abstracts and really help make more of an impact. the colors are beautiful – and I LOVE the idea of white circles on top of it. I’m not good at this stuff though 😐 Oh to imagine what Jill and Lin would do !!!! Can’t wait to hear! You and me both! Glad you liked. This may be the first non-face I’ve posted all year. This is beautiful and reminds me of the incredibly beautiful sunrises we have been having this winter. Love the mix of colors! Beautiful! I’ll look forward to seeing you additions and your Raptor, my favorite bird. What do you think, Sharon? Circles? I think this is what’s good about representational art. I’m not left with more questions than answers when I stop working lol. I’m glad you like it! Overlapping circles and some splatters would be fun! Just have a good time! Ooh nice thought. Thanks Laura! Glad the weather is clearing. My thought is to just play around and see what works. Circles sound good they would break up the verticals. Abstract is not my strong point! Thanks, Carmel! I enjoy abstract but I find realism easier. Thanks, Teresa! What a great memory and song to call up for us both! 😀 Glad you enjoyed it! You’re very welcome, Charlie! I’m so glad you’ve missed my abstracts. A man after my heart ❤ I forgot how much I've missed doing them! Back to faces tomorrow tho lol. Glad you enjoyed this. I have added more already and may do a repost! Thank you, Jill! I really appreciate it. I surprised myself today with a purchase…….will share (hopefully) sometime soonish, if I make something worth posting lol. But it’s your influence that’s done it! ❤ Thanks for your help & encouragement. I'd like to play this busy season more with color and I think MM is a good avenue especially during this busy time and also in the winter….we need more color! There are, Jill, or I wouldn’t even try, my friend! I’m not adventurous like you. Maybe it’s the accountant DNA or something but I always feel I need some type of plan. And I can be really dense sometimes. So yeah, I’ve been watching YouTubes and getting inspired! I don’t suppose you’ve put out any videos on your process? Would be awesome to see, as I love the results you get! Oh, yes this is the fun part! I print several papers at one time so they have a chance to dry in between. Do you have a brayer? 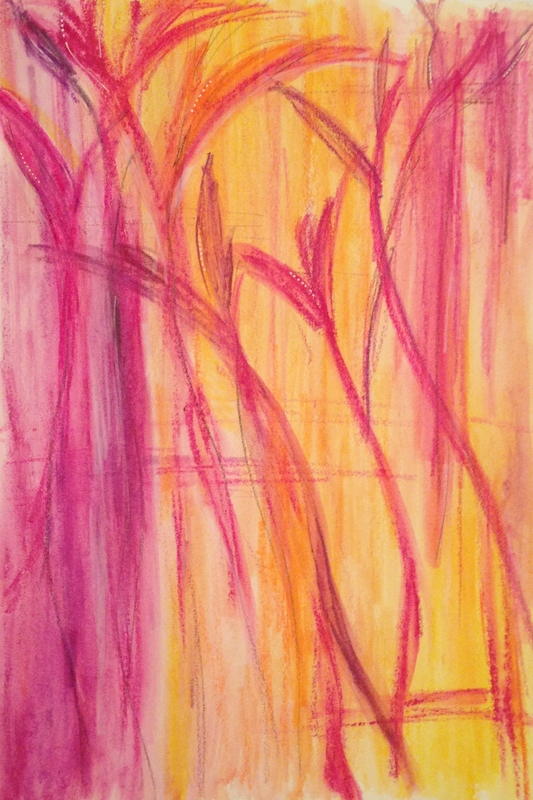 What lush warm colours…lol I have been playing with neocolors too, but not so abstract, more cutsie! ( hares) I think they are a great medium for cheering up! Vivid lush colours, so creamy , it’s hard to stop. I love all the ideas above, bubble wrap and circles from jar top, always good. I love using found items, In fact I have not done so for ages. Play play play, I am convinced they were the let your hair down art supply, not the suit and tie sort! Let’s hope, after 2.5 feet of snow last weekend! Glad you enjoyed it Ann! Love the vibrant colors! It instantly reminded me of my daughter (now 28) when she was a teenager and HAD to paint her room two walls hot pink and two walls bright orange. This would have looked awesome on one of her walls! It really would’ve! She has great taste hehe! :))) Those are great colors! Glad you enjoyed!